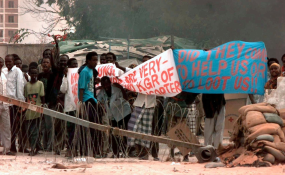 Somalis protest at gate eight of the US Embassy in Mogadishu in February 1993. As the US bids farewell to former US President George H.W. Bush, in Africa he is remembered most for his failed bid to stabilize Somalia, write DW's Isaac Mugabi. One day later, Somali president Mohamed Abdullahi Mohamed chose not to dwell on the past. In a brief statement released early on Sunday, he expressed "heartfelt condolences." However, Bush's demise has refuelled a debate among some Somalis about the US presence in the 1990s. For some, it was an opportunity to remember family members and friends who were killed in crossfire with warlords, while for others, it brought back memories of thousands of starving people who were saved. The failed Somalia mission changed US policy in Africa forever. With two Black Hawk helicopters shot down and 18 soldiers dead, Bush's ego and policy in Africa were both greatly diminished. Six months later, the US withdrew its forces from Somalia. This was the turning point in one of the United States' crucial interventions in Africa's hotspots and the perceived failure of the Somalia mission made the US wary of intervening in other African crises. The events at the time profoundly changed the way the US approached Africa. Unsurprisingly no one has talked about this since Bush's death. But because of that failed mission, Bush's successor Bill Clinton watched on as genocide was perpetrated in Rwanda soon after, claiming more than a million lives. Under Clinton, the US administration focused more on supporting the continent in dealing with health matters rather than conflict resolution, especially in Africa's hotspots. The Somalia disaster was something that the Americans never wanted to experience again. After decades of the US generally leaving the Somalis to sort themselves out, even under Bush's son, George W. Bush, it is now the Trump administration that has endeavored to support Somalia in counter terror operations. There are currently around 500 US military personnel whose main goal is to fight the al Shabab militants.